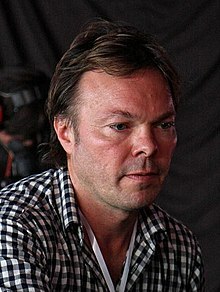 Peter Michael Tong MBE (born 30 July 1960), better known as Pete Tong, is an English disc jockey who works for BBC Radio 1. He is the host of programmes such as Essential Mix and Essential Selection on the radio service, which can be heard through Internet radio streams, for his record label FFRR Records, and for his own performances at nightclubs and music festivals. Tong has also worked as a record producer, and is regarded as the "global ambassador for electronic music"
The phrase "It's all gone Pete Tong", where the name is used as rhyming slang for "a bit wrong", was reputedly first coined by Paul Oakenfold in late 1987 in an article about acid house called "Bermondsey Goes Balearic" for Terry Farley and Pete Heller's Boys Own fanzine. It's All Gone Pete Tong is also the title of a 2004 film which portrays a fictional DJ's experiences as he realizes he is becoming deaf. Tong appears briefly in the film. It is also the name Tong has adopted for his club night at the nightclub Pacha in Ibiza and his nightly radio programme in the United States on iHeartRadio's "Evolution" EDM format platform. In 2008, Tong was involved with organizing the International Music Summit in Ibiza, an event that has become an annual fixture (the 2016 Summit was held during 25–27 May). In 2017, Tong won Radio Show of the Year at the Electronic Music Awards for "The Essential Collection". Tong was born in Dartford, Kent in 1960, and was educated at King's School, Rochester, Kent. Tong's original musical interest was in drumming, but he soon moved on to DJing. He played his first public gig at a friend's wedding at age 15. While at school he and a couple of friends earned some extra money by promoting a couple of local bands and booking halls for gigs. He also worked as part of the Kent "Soul Mafia" bringing soul weekenders to seaside towns such as Caister-on-Sea and Prestatyn. Tong was heavily influenced by the late DJ Froggy in his early years. Initially after leaving school, Tong set up a mobile disco based in a Ford Transit van, but he soon started his own club in Baker Street called Family Function. He also booked bands for an alternative night, the first of which was the then unknown Culture Club. Tong originally performed as a DJ using the name "Kickstart Roadshow" and then later "OHMS Roadshow" with an extensive sound system. Later he became DJ and promoter at the Kings Lodge club in West Kingsdown. Later moving venue to the Hill Top, also in West Kingsdown, he was responsible for breaking classics such as Lonnie Liston Smith's "Expansions" and Ritchie Cole's "Groovin on a New York Afternoon". In 1979, Tong became an advertising sales assistant for Blues & Soul Magazine. After a year he also contributed some reviews, gossip and sales charts, which continued until 1983. He left Blues & Soul to join London Records as an A&R manager. Through his connections in London Records, Tong was exposed to the newly emerging house music sound from Chicago. In 1986, Tong organised a compilation album, The House Sound of Chicago, Vol. 1, the first British release to gather and expose this genre. Tong's first appearance on radio was in the late 1970s on Radio Invicta 92.4fm, Europe's first soul music station. He joined a rotation of nightclub DJs to present monthly guest shows. Later, he appeared on local radio station BBC Radio Medway, as part of the 'Soul Mafia', and performed occasional mixes for Radio London. In 1981, Tong made his first appearance on Radio 1 as the host of a 15-minute feature on Peter Powell's show—he played new tracks, and covered the latest gossip and news from the dance music industry. When Invicta Radio started in Kent in 1984, Tong became the host of a regular soul show on the station. As Tong had joined the developing dance-DJ management company of DJ-turned-journalist Eddie Gordon, of the Kent Messenger, he built a prominent county profile and performed at Gordon's local club 'The Slammer'. Tong joined Capital Radio in 1988 to present a weekly dance programme. In January 1991, Tong began his Friday evening show, branded as the Essential Selection for its first 15 years, on BBC Radio 1. The show still continues every week (currently it is broadcast at 9pm for two hours, either pre-recorded from Tong's garage at his home in Los Angeles, or live from the eighth floor of Broadcasting House), and Tong is the second-longest serving living DJ (after Annie Nightingale) on the station. Additionally, a one-hour Sunday edition of the programme, called "The Essential Selection - Part 2", was broadcast from April 1992 to April 1993. A spinoff, titled The Rap Selection (featuring rap, ragga and new jack swing), aired on Thursday evenings on the station from 9-10pm from April 1991 until March 1992. From October 1993, Tong oversaw the production of the Essential Mix show, which was devised and, until 2003, produced by Gordon. The show was the first BBC production to broadcast live from Ibiza, Spain. The 500th mix was broadcast on 23/24 April 2010, featuring solely Tong on the Friday night, and Tong, plus DJs Sasha and Richie Hawtin, live from Circus nightclub in Liverpool, UK, for the second section. In November 2012, Tong was asked by Clear Channel Communications in the US to help launch a new EDM channel, on their iHeartRadio platform, called 'Evolution'. Along with the launch of the channel, Tong introduced a nightly two-hour programme titled Its All Gone Pete Tong, which is similar to his BBC 1 programme. The platform would later form the basis for Clear Channel to expand the Evolution brand, with the 20 December 2012 launch of the format on WEDX/Boston that included Tong's station promos and voiceovers. Likewise, Tong's iHeartRadio programme is also broadcast on WEDX. In addition, a supplemental 2-hour weekly programme, Evolution Beatport Show, is also aired on various Top 40/CHR and Rhythmic stations in the U.S. and in other countries, and is syndicated by Premiere Networks. Tong is one of Britain's most recognised DJs, having gained a large following of fans from his Essential Selection programme. He was appointed a Member of the Most Excellent Order of the British Empire in the 2014 New Year Honours for services to Broadcasting and Music. From 2003 to 2007, Tong was the resident DJ at Pacha nightclub in Ibiza, where he oversaw the Pure Pacha events. In 2008 Tong left Pacha and signed with Eden nightclub in Sant Antoni de Portmany to host his own Wonderland night. Tong explained in a 2009 interview that he, "from a UK perspective", he has played in Ibiza since inception (1991) and, as of the time of the interview, divided his time between the UK, Ibiza and the US. In March 2011, he announced that he would be returning to Pacha on Friday nights with a new event named 'All Gone Pete Tong'. Tong played the Together Winter Music Festival in London, UK, at Alexandra Palace on 26 November 2011. He appeared in the 2016 Grammy-nominated documentary film about American DJ and producer Steve Aoki, titled I'll Sleep When I'm Dead. Tong has returned to DJ in his native Kent several times in his professional career, including several stints at The Loft in Maidstone. Additionally, Tong hosts a pool party each year during Miami Music Week at one of the hotels on South Beach. In 2018, Tong was joined by Idris Elba, The Black Madonna, Black Coffee and The Martinez Brothers, among others. All chart positions are in the UK Compilation Chart except for Classic House (2016) and Ibiza Classics (2017) where the chart positions are for the UK Albums Chart. ^ "Pete Tong". BBC Radio 1. BBC. 28 September 2012. Retrieved 4 October 2012. ^ Richard Smirke (25 May 2011). "Pete Tong Teams With Warner U.K. To Relaunch FFRR Label". Biillboard.biz. Billboard. Retrieved 4 October 2012. ^ "ARISE, SIR PETE OF TONG!". DJMag.com. Retrieved 29 June 2016. ^ "The Story of Boy's Own: The Acid House Gang Who Changed British Clubbing | VICE | United Kingdom". Retrieved 29 June 2016. ^ Romero, Dennis (7 April 2015). "Pete Tong Wants to Save EDM From Itself". Retrieved 29 June 2016. ^ "It's All Gone Pete Tong (2004)". IMDb. IMDb.com, Inc. 1990–2012. Retrieved 4 October 2012. ^ "Evolution 101.7 – All Things Dance for Boston | Listen Live | iHeartRadio". Iheart.com. Retrieved 13 July 2014. ^ "About All Gone Pete Tong | Get Articles, Bio & Show Info | Evolution". Retrieved 29 June 2016. ^ "Pete Tong - IMS". Retrieved 29 June 2016. ^ Antwan Shalom (2012). "Pete Tong Interview for IMS 2012 (English)". electrocorp (in English and French). Electrocorp – Le Magazine des Musiques Electroniques. Retrieved 4 October 2012. ^ "Index entry". FreeBMD. ONS. Retrieved 28 January 2017. ^ a b "It's all going Pete Tong". BBC Kent. 25 August 2007. Retrieved 17 June 2014. ^ a b "MEDIA - John Hemming-Clark". www.inyougo.webeden.co.uk. ^ "Pete Tong | .gr". www.clubber.gr. Archived from the original on 27 May 2012. Retrieved 29 June 2016. ^ "U.K. Jazz Funk/". www.culturesofsoul.com. Archived from the original on 5 August 2016. Retrieved 29 June 2016. ^ Brewster, Bill (7 September 2004). "Froggy". DJ History. Archived from the original on 20 August 2016. Retrieved 29 June 2016. ^ "Blues & Soul Magazine". Bluesandsoul.com. Retrieved 13 July 2014. ^ a b "Radio 1 celebrates 500th DJ to take part in Essential Mix with special live broadcast". BBC Radio 1. 2 April 2010. ^ "No. 60728". The London Gazette (Supplement). 31 December 2013. p. 24. ^ "BBC News – Radio 1 DJ Pete Tong honoured with an MBE". Bbc.co.uk. 30 December 2013. Retrieved 13 July 2014. ^ "Interview: Pete Tong, Wonderland, Ibiza" (Video upload). DJSounds.com. DJSounds.com. 12 November 2009. Retrieved 1 September 2014. ^ "Confirmed: Pure Pacha All Gone Pete Tong". Ibiza Spotlight. Ibiza Spotlight S.L. 18 March 2011. Retrieved 1 September 2014. ^ Catherine Elliott (31 October 2011). "DJ AT TOGETHER WINTER MUSIC FEST". Mixmag. Development Hell Ltd. Archived from the original on 21 June 2012. Retrieved 1 September 2014. ^ "It's all going Pete Tong". BBC Kent. 22 August 2007. Retrieved 5 January 2018. ^ "All Gone Miami Pool Party!". ^ "All Gone Pete Tong". www.miamimusicweek.com. Wikimedia Commons has media related to Pete Tong.